Now, as King continues the transition to 2020 retirement, the network of schools—specifically the network office—is already seeing big changes. King announced at the retreat—held Oct. 20 and 21 at the Franciscan Center in Colorado Springs—some of these transitions. He reported that Sandi Brown will fulfill the newly created position of CEC Executive Administrator. In this new role, which starts Jan. 1, 2018, Brown will oversee all school-based and academic programs including curriculum, school finances. Brown, currently CEC Fort Collins Head of School, will remain in Fort Collins in her new position. Upon CEC Board approval in November, the network will begin advertising a second new role, CEC Chief Administrator, which will be advertised and open to the public. The person hired in this role will start Jan. 1, 2018. King will continue in his role as Administrator, but says his position will continue to evolve as he prepares for his retirement in 2020. CEC learned at the retreat that two CEC Leadership members are leaving the network: Scott Anderson, Chief Financial Officer, and John White, CEC Parker (CECP) Dean of Admissions, are moving on to other opportunities. CEC Parker Head of School Alex Tuel, Ed.D., said John White will be deeply missed. King said there are more Network office changes, which will be announced in the next newsletter. 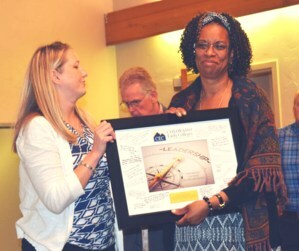 Photo, top right: Colorado Springs Early Colleges Head of School Jennifer Daugherty present CEC Governing Board President Deborah Hendrix with an award honoring her 11 years of service to the network.